The spiral wheels in Duet are pushed in the same direction when the wheel that carries them rotates in the clockwise direction. They rotate freely when the carrying wheel counter-rotates. I find interesting patterns emerge at the tips of the spirals where I've placed the dark accents. These points remind me of a pair of dolphins playing. At times their movements are synchronized as the spirals move at the same rate in the same phase. 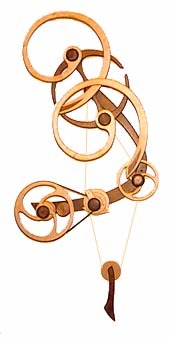 At other times the motion is 180° out of phase and the spirals intertwine at the center of the carrying wheel. The motion of the three upper wheels lock together as the spirals match speed and gain momentum from the carrying wheel. The spirals break free and begin their intertwining dance again as the carrying wheel begins to slow and reverse.